I am OK, but Nepal is not. The part of the country that got hit the hardest is the remote Gorkha district. Many small towns and villages are still not included in any government search and rescue effort. This is one of many stories from the area: One day, six volunteers and two villages. When the earthquake hit, Peter was working as a paragliding guide in Pokhara. That meant he had access to a 4x4 and was motivated to help. Pokhara was largely spared, but rural areas nearby were not. “Don’t know the name of this valley,” he told us. “But it’s in Gorkha district, at the epicenter of the earthquake. Between villages Muchok, Dhansar and Saurpani.” If you want to help he and his friends with their impromptu relief effort, details are on KarmaFlights.org. — Ed. It takes about 2 hours to drive 100km road from Pokhara to the end of the paved road, around 3 to 4 hours to drive the rest of the 30km to the relief base camp. The non paved part of the road is 4x4 only, especially in the rainy conditions. 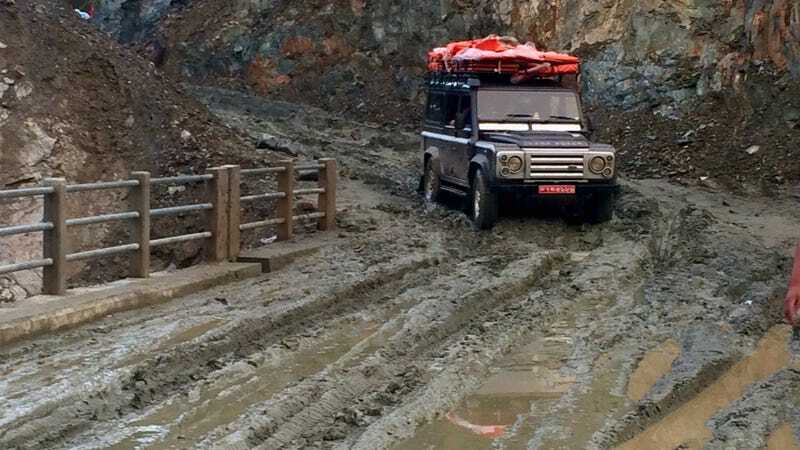 By now, many of the paragliding companies from Pokhara have started to lend their off-road vehicles to deliver the supplies. The beautiful scenery on the way to the basecamp. All the non medical non essential volunteers have been asked not to come, unless they are 100% self sufficient. All the supplies delivered are used to help people in need. Many landslides along the way complicate the access and keep threatening the villages during the earthquake and the rainy season. Four of us were hanging on the high side for this crossing, to keep the truck from rolling into the valley below. Mandip is a badass driver! In future captions I will refer to the first organization helping in this area as “us” or “our.” I’m in no way trying to take any credit whatsoever. I’ve helped and was a tiny part of it before the earthquake, and I’ve tried and continue to help now. Unfortunately, in the current situation, I don’t want to use any names. If you stick to it and read all the captions with all the images, it will become very clear. The cash donations are being used to buy all the necessary supplies locally. This way we are able to avoid all the mess currently growing in Katmandu, while supporting the local economy by shopping locally. Bringing supplies and medical help to the villages half way up the mountain. Most of the houses in the village were destroyed. The ones still standing could collapse at any moment. All the people from the village take cover in what used to be a livestock shelter. Everyone is hoping to receive any help. From below by foot, or from the air. Military helicopters started delivering some supplies 5 days after the earthquake, but they can only land in the villages located at the top of the mountain. Bamboo structure of a livestock stable provides a relative safety during constant tremors. Our team was of 3 medics with medical supplies, 2 paragliding pilots bringing large heavy duty tarps to build a shelter and some food, and a Nepali translator. Many villages have been completely wiped out, the buildings still standing could collapse at any moment. A huge effort and funds will be needed to rebuild these homes, and none of it will come from the government. Many people whom we’ve met had very little before the earthquake. Now all they have is their lives. All, 100% of all the donations we receive, will go towards helping physical people. First with all the medical help we can offer, later to help with rebuilding, livestock purchases, or whatever is necessary. Gorkha district is one of the most beautiful parts of Nepal. People are still dying from the injuries, lack of food, water and shelter. Since the earthquake and the heavy rains that followed, the road access stops in the valley 400 vertical meters below. An elderly woman is waiting her turn for a proper medical treatment. All of the injuries we’ve seen were not treated properly, most were badly infected. A five-year-old boy with a huge leg wound is being held by a family member. His mother was killed in the earthquake, his father is at her funeral. This lady was pulled out of her collapsed house. She has multiple lacerations, very bad one below her right eye, the eye socket is infected. The 5-year-old boy is being carried down by his stepmother. We asked her to bring him down to our camp, where the vehicle is ready to transport him to the hospital. She starts to walk down, as we continue the work in the village, hoping to catch up to her by the time she gets down. What became a field hospital for a couple of hours is the shelter at night for the most of the village. Daughter and her mother, after the treatment, receiving some bandages, antibiotics and instructions to keep taking care of their wounds later. After hearing of a medical help coming to Pokharidada, this lady carries her mother a few kilometers from the other side of the valley. On the steep roads and narrow foothpaths, this is the easiest way to carry a patient, and much more comfortable for her, than a stretcher. Her head injury, where the skull is visible, requires hospital treatment. This is on the way down to the jeep in our basecamp. Taking a break in the ricefields. We used up all of our drinking water to clean the injuries. The only liquid we could buy in the village was Pepsi and Mountain Dew. Nepali ambulance switching to the German ambulance. Walking down towards the basecamp and the waiting jeep. Many people are scared to live here now and are talking about moving to town. A mass exodus could create another Kathmandu, over populated, polluted and poorly constructed city. With not enough jobs and just waiting for another disaster. Perhaps the tourism could create some income for the people living here. Being lower and more gradual than the popular tourist destination, this area could be a mountain biking heaven. The tap is dry at the moment, but when it runs again, it’s becoming more and more polluted by decomposing human and animal bodies around. We distributed many water treatment tablets, but many more, together with boiling the water and education will be needed with months to come. I “hired” these two boys to help me with the crowd control, while the medical staff was treating the patients. After I “paid” them with a few dried noodle packs, they broke them all open and shared them with the rest of the village. The night shelter being used as a makeshift clinic on the left, what used to be houses on the right. Half an hour later after the lady carried away the 5 year old boy, my friend called me, that she is not walking down, walking to her home instead. We ran down to catch up with her and explained to her, that she doesn’t have to pay for the hospital, our organization will. Then we explained the same to the village elders, making them promise, the boy gets down to our camp within the day. Otherwise his leg will have to be amputated.